Since several hundred people gathered to watch the cornerstone be placed on November 18, 1930, downtown Fargo’s Black Building has captured the imaginations of North Dakotans. As we embark on writing the next chapter for the iconic landmark, we look to the past. T.F. Powers & Co., the construction company, called the Black Building its masterpiece. Other superlatives used to describe the structure included center of activity that was flooded with merchandise, pride of Fargoans, and veritable cathedral of business activity. Ads for the building boasted that “if all of the electrical wiring and piping in the Building were placed end to end it would reach from Fargo, N.D. to Ulen, Minn., or a distance of 32 miles.” Another reads “The Black Building offers better elevator service, lighting and ventilation, plus PRESTIGE. Another line: Seeing Fargo always incudes a tour of Broadway’s tall white structure, known far and wide as The Black Building. Our vision is to return the Black Building to its rightful place in Fargo’s history as a destination unto itself. Want to submit a question or idea about the Black Building? When George M. Black came to Fargo 1912, he leased (for $135 per month) the space at 112 Broadway and opened a store at the space. Within a few years, Black purchased the property at 112 Broadway as well as the neighboring properties at 114 Broadway and 110 Broadway. 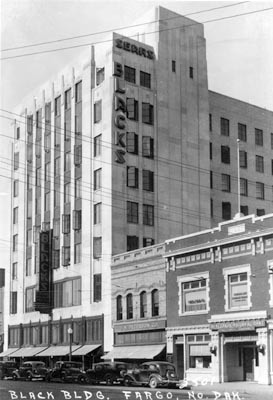 In 1929, Sears, Roebuck and Company, interested in opening business in Fargo, offered to buy Black’s properties. Black accepted the offer and used the proceeds from the sale to help finance construction of the Black Building. The new building provided a lower level, balcony and second floor for Sears and six stories for offices. The new building was once mentioned in Ripley’s “Believe it or Not” newspaper features because the Black Building was white. 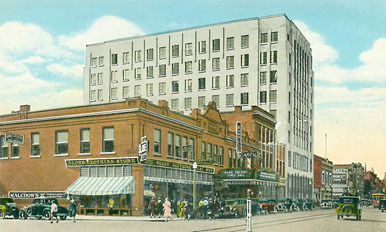 The eight-story Black Building was Fargo’s tallest building for many years. It was also the tallest building in North Dakota for about five years, until the North Dakota State Capitol was built in Bismarck. 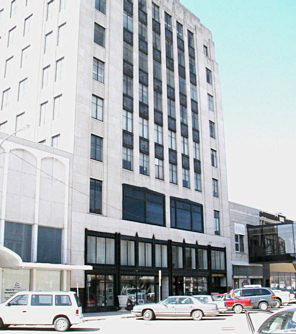 The Art Moderne building, constructed of Indiana limestone, was designed by Lang, Raugland, and Lewis of Minneapolis with the Fargo firm of Braseth and Houkom as associates. T.F. Powers Construction built the building. The cornerstone was laid on November 17, 1930, and the Black Building and the Sears and Roebuck store opened for business in 1931. In the distant future, when the Black Building must give way to a new-age ‘sky scraper,’ wreckers will uncover a copper box now securely sealed in the northeast cornerstone. Among its hermetically sealed contents are samples of North Dakota grain products, newspapers, Book of Golden Friendship, biographies, photographs and other objects. The event of the cornerstone laying was unusual in building annals, and was participated in by high officials of city and state and by thousands over a vast territory who had been advised of the event and were ‘present’ by radio. After the construction of the Black Building, George Black established a new store 621-623 1st Avenue North, the Store Without a Name. The eighth floor of the Black Building was leased to WDAY, and for many years as part of the lease agreement, the station would use the phrase “This is WDAY in the Black Building, Fargo” during their sign-on. Singer Peggy Lee’s musical career was started at WDAY, singing in the WDAY studios in the Black Building. William A. Schlossman and William Bunce joined Black in his various business ventures in 1945. Black’s daughter Anna Jane married Schlossman who later created West Acres Mall. In 1968, Sears Roebuck announced it would be moving as the first tenant in the West Acres Mall. Sears relocated there in 1972, the same year that George M. Black died, at the age of 90. In the 1970’s and 1980’s, the Black Building was managed by William Schlossman and John Gunkelman (Schlossman & Gunkelman Realty). In 1975, Schlossman renovated the empty Sears portion of the Black Building into a mixed retail mall. The development was called Elm Tree Square, and was developed by Scholssman to answer his critics who said that the West Acres development would kill downtown. The space was designed to have a Mid-America small town feel, with storefronts surrounding an open courtyard featuring thirty foot imitation elm trees, and a cascading fountain. In 1986, the Black Co. sold the Black Building to a local investment group for $1.8 million plus $50,000 for a parking lot. Developer Rick Jordahl obtained MIDA bonds of $2.75 million for improvements. Some of the improvements, such as installation of automatic elevators, updated the building, but changed some of the historic charm. Gone were the ‘elevator operators to modern technology. The bond backing that deal was declared in default in 1990 (the largest municipal industrial revenue bond failure in North Dakota history). 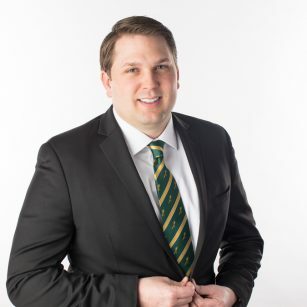 The bonds were issued by the city of Fargo, which lent its name — but no financial backing — to the bonds and therefore made the bonds tax-exempt for investors, with a return of 9 percent. Dougherty Dawkins, the underwriter, bought the bonds and resold them to investors around the country in increments of $5,000. In 1993, just days before bondholders would have had to forfeit the Black building for back taxes; a judge approved its sale to LTD Inc. of Grand Forks, ND, for $700,000. From the sale of the building, after back taxes were paid, bondholders were compensated at from 1 to 3 cents on the dollar. 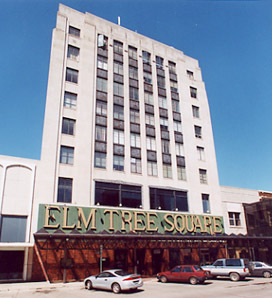 On April 17, 2002, the large “Elm Tree Square” sign was removed from the front of the building as part of Fargo’s Broadway Streetscape project. The sign, placed on the buildings in the 1970’s, blocked the second story windows which were restored. Lloyd Sampson, managing owner of the building at 118 Broadway, wanted to restore the building to its original 1932 appearance.